You know when you keep putting off calling a friend that it seems strange to call them after months of not talking, but you finally do, it feels like you haven't missed a day? I hope that is how I feel by the end of this post. I've started this paragraph a few times, but I can't seem to get going. I think I'm fatigued. Or anxious. Perhaps about my really long to-do lists. Maybe it's my slower work schedule. My freelance contract at ModCloth ended last week. I have lots of time. And lots of to-dos. There, that wasn't so hard. Ok, it was kind of. Despite having more time where I can do my to-dos, I'm not able to get started tonight. It's like the long distance race has begun. I can see all the other little runners ahead in the distance, while I sit in a lawn chair back at the starting line. Probably eating something involved peanut butter and a starch. I think I need a vacation. Good thing we're going on one in February. Where, you may ask? No idea yet. Hopefully a place with water and sunshine and beer. And a big comfy bed. No updates on my chapbook. I do have ice cream in my freezer. I think I'll eat some of it. There. I broke the ice. I've reached the end. I don't really feel 'back in the blogging groove' just yet. But that's ok. Now that we've finally spoken, hopefully I won't wait so long before I call again. 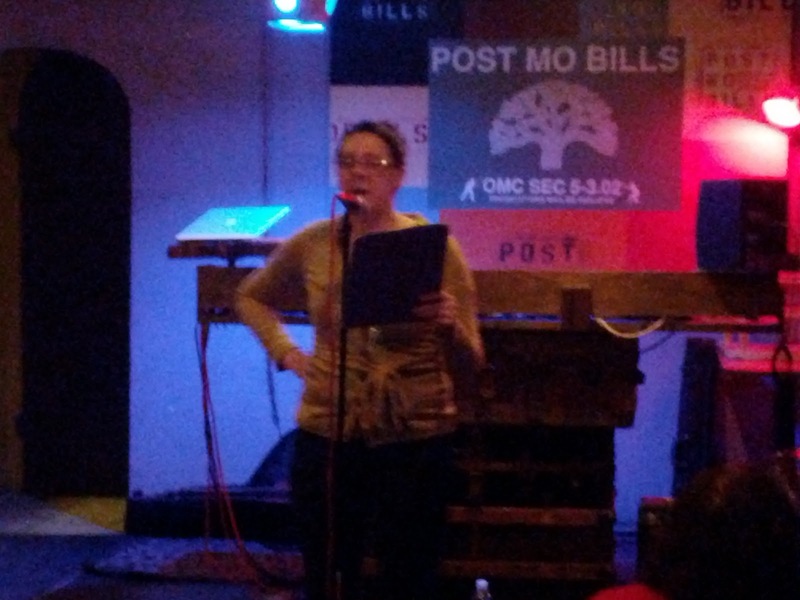 Here's a blurry picture of me reading at East Bay on the Brain last Saturday. Perhaps I'll tell you about it next time.